It’s no surprise to you all that I adore embroidery. Just as you can add beautiful embellishment to paper with stitches, you can add embroidery stitches into patterned fabric and enhance its beauty. 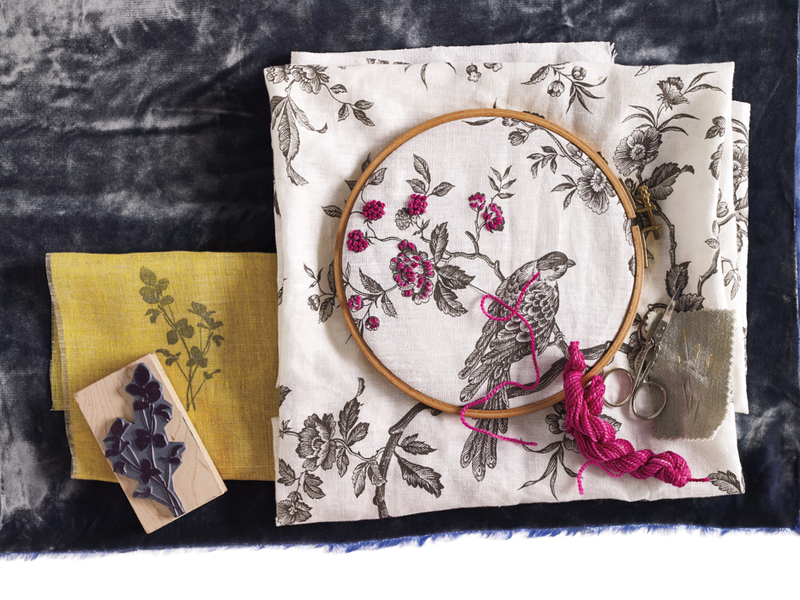 It is that lovely time of the month when I get to share a Martha Stewart craft tutorial and I couldn’t be happier to share some embroidery basics and these transformed textiles with you. A blank canvas can sometimes be overwhelming to tackle. This decorative technique lets you dive right in to the craft of embroidery with a project that looks gorgeous from the start. 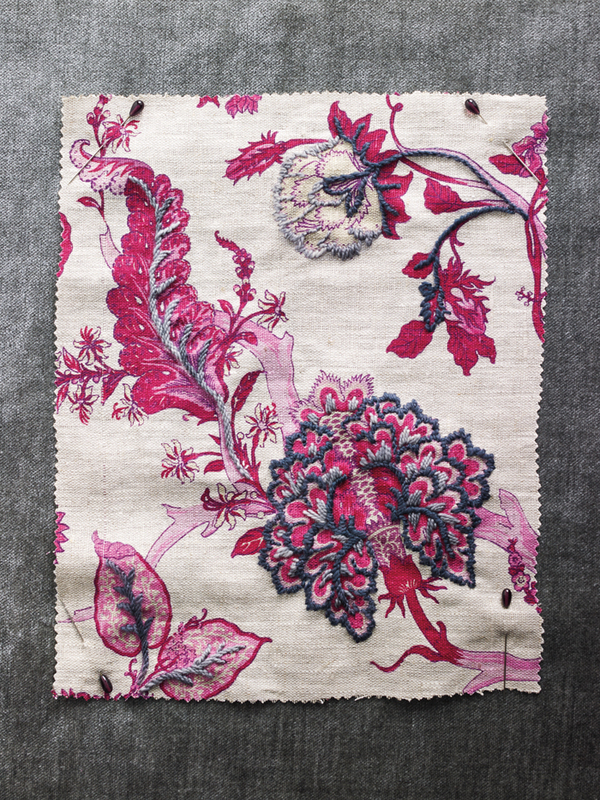 The pink linen print above is embellished using the satin stitch and chain stitch with hand dyed wool thread in dark and light grays. I, for one, can’t wait to tackle this technique on my own! What I love about it is that there’s none of the bothersome stuff to start with. You don’t need to sketch, trace or transfer, you just stitch. 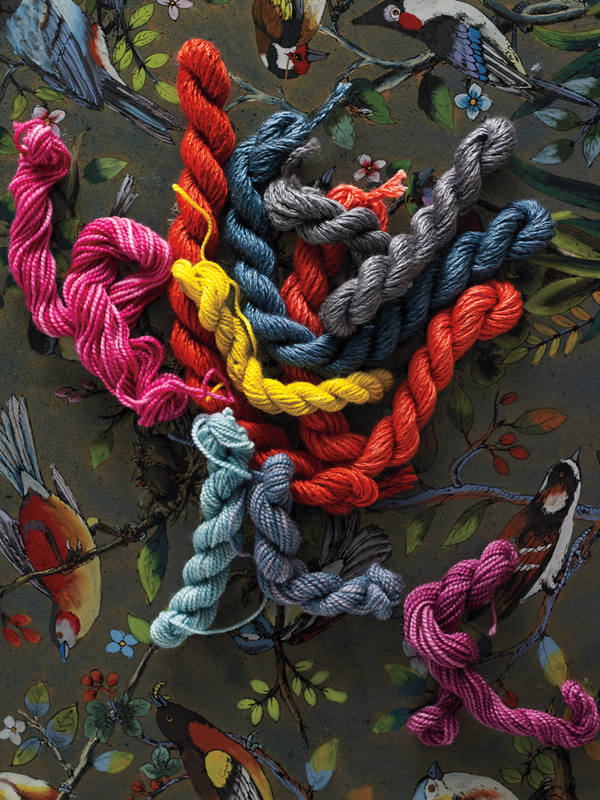 Embroidering with wool yarn, like above, is known as crewelwork. 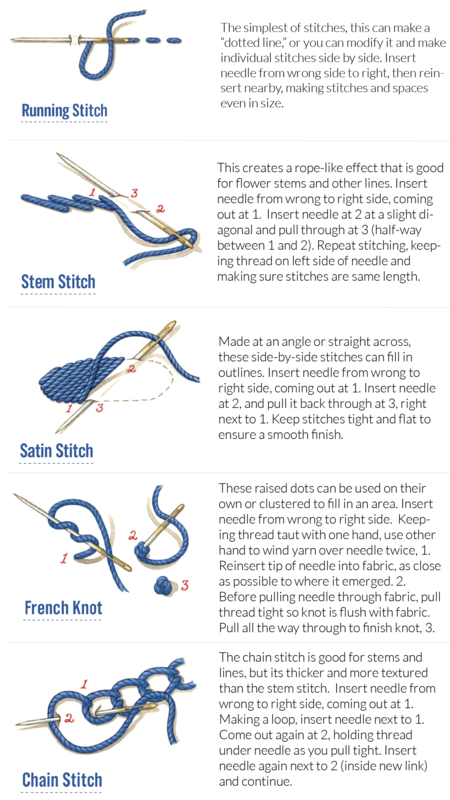 Here in this Lemongrass Floral print you see running stitches and French knots (see below for embroidery stitch how-to). 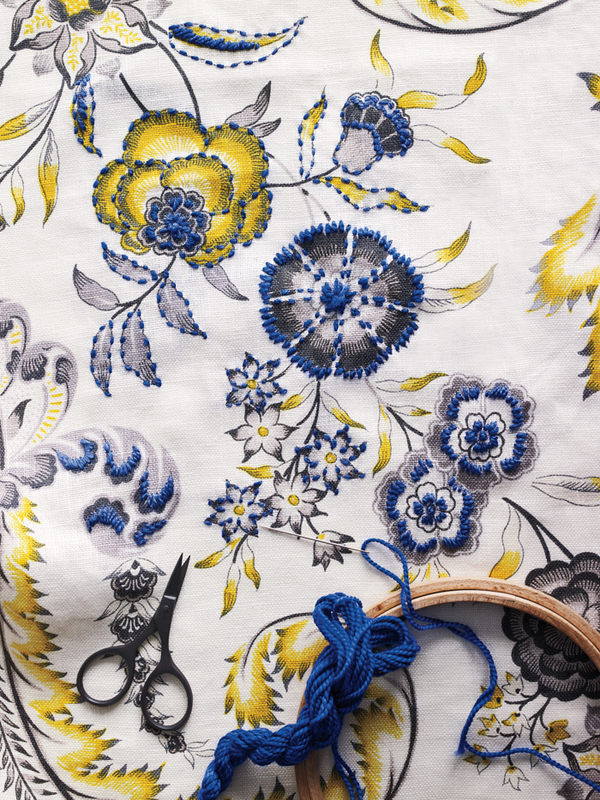 I adore how the contrasting blue on this yellow and gray print makes the fabric come alive! The stitches highlight the design of this Nobelesse bleached linen viscose in such a stunning way–creating a piece that is just so gorgeously hand made. The embroidery expertly adds texture and dimension. Using silk and wool thread adds a nice sheen. The chain stitch is used here for the stems, while the satin stitch is used to fill in larger areas like the petal outlines. There are so many variations for this technique. 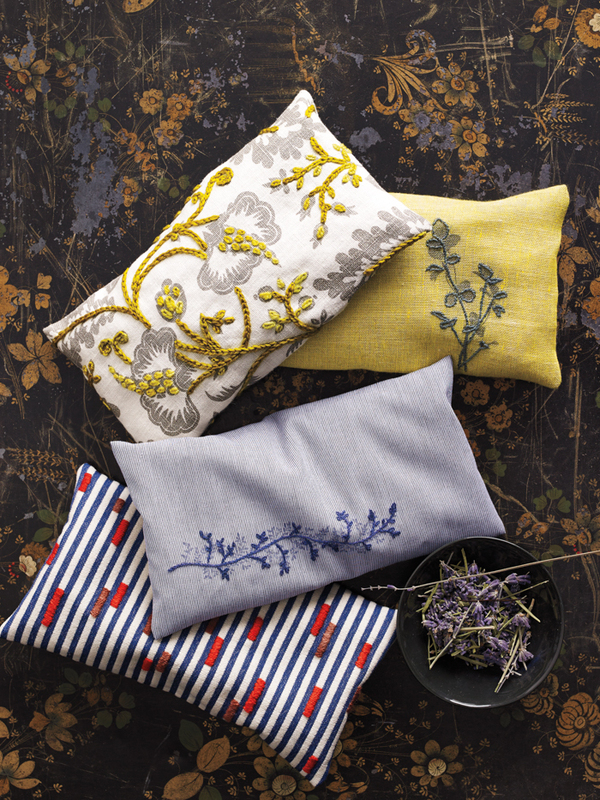 If you don’t want to start with something so big, make a little lavender sachet, like above. Use more than a pretty floral like the Bologna linen. Look how charming the hand stamped fabrics on the right are with their design highlighted with simple stitches. I love how the graphic print works so well with this technique, too. The blocks of red satin stitching make this striped fabric pop! This beautiful HL-Pastorale black and white linen above might just be my abslolute favorite. It is embroidered with stem stitch and satin stitch with hand-dyed wool thread (see the embroidery stitch how-to below). Seriously, I was smitten for this embroidery work the moment I saw it in the pages of Martha Stewart Living. 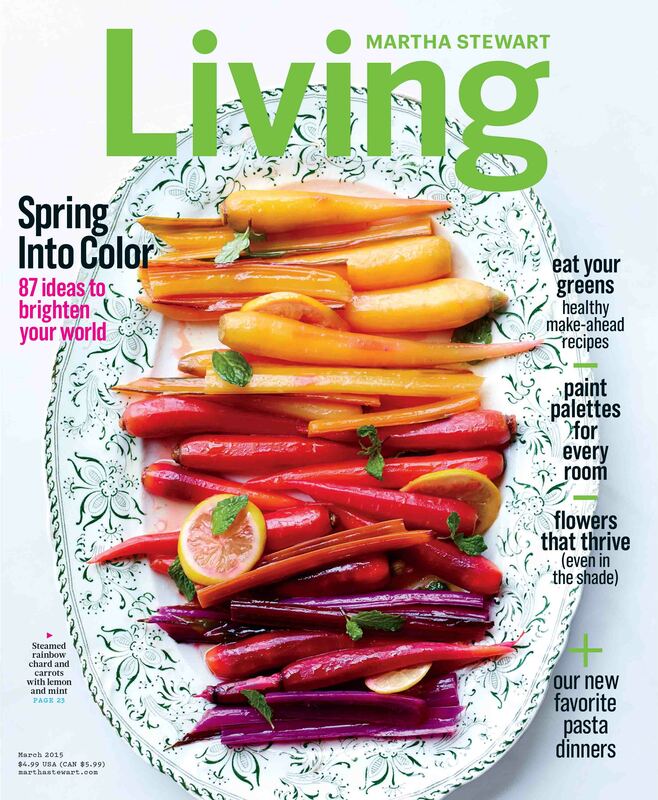 The rest of the magazine, which can be found on magazine stands now, includes how to use color in your home’s interior, gorgeous and colorful pasta recipes, and how-to decoupaged floral trays. Your handy-dandy embroidery primer is below. Use it to create all sorts of beautiful work! Embroidery Hoop: This holds the fabric taut to allow for even stitches. Very heavy or stiff fabric may not fit into a hoop but has enough “body” for you to work without one. Needles: These may be called embroidery, crewel, or millinery needles. Match the needle to the thread and the fabric: For example, use a thicker needle with a larger eye with thicker thread on heavyweight fabric. Embroidery Scissors: These small, sharp scissors give you control when you’re snipping threads. Embroidery Thread or Wool: Several kinds of thread are available. The most important thing is to choose a thread that is a good fit for your fabric. A too thick thread might pucker a thin fabric, etc. 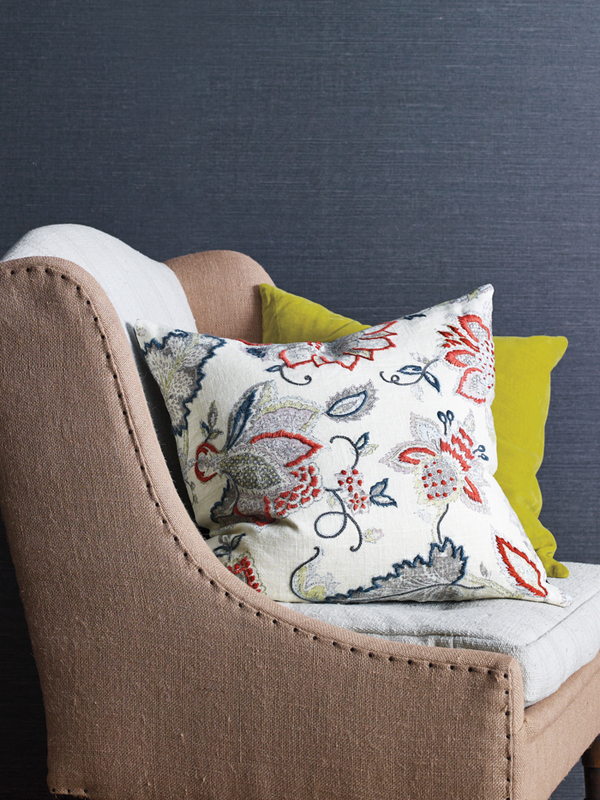 Most of these projects were done on heavier-weight upholstery fabrics which call for thicker silk and wool threads. Hand dyed wool yarn, like Koigu or Trio needlepoint yarn, work beautifully and add stunning variations in color. For a lighter weight woven fabric, your typical DMC embroidery floss divided into two or three strands is best. 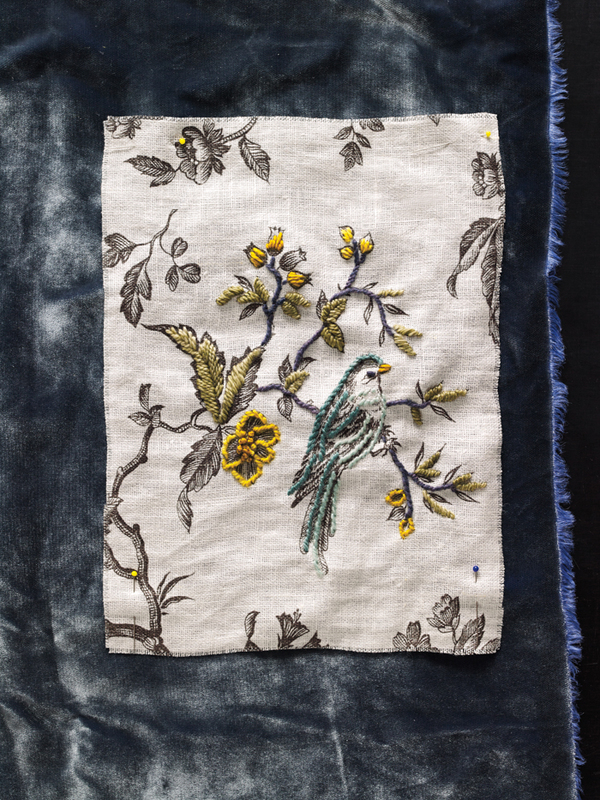 Here are five classic embroidery stitches used to decorate the textiles in the photos above. The embroidery work in this post was created by Tanya Graff, Silke Stoddard, and Jennifer Wagner. Illustrations by Elizabeth Traynor. Permission to post tutorial in full given to Flax & Twine by Martha Stewart Living. Anne…. This is so elegant. Old- world charm, for sure. May I ask please, where would you recommend purchasing these types of scrumptious fabrics? Say….Joanne Fabrics? You do lovely work. Thanks so much Nancy! I’ve provided a link to each of the fabrics shown in this post – just click on the pink words. You could find similar fabric at Joann’s, but you’ll want to look at the home dec section, not the regular bolts. I would wait until 50% off sale (they do that sometimes) and then the fabric is really reasonable. Have fun! Thanks so much Anne. My Rowan yarn came in on Friday.. Looking forward to making that beautuful arm knit scarf/ cowl. Yay Nancy! Congratulations! I’m so excited for you to make that beautiful cowl!